Thousands of years hence, many races inhabit a universe where a mind's potential is determined by its location in space, from superintelligent entities in the Transcend, to the limited minds of the Unthinking Depths, where only simple creatures and technology can function. Nobody knows what strange force partitioned space into these 'regions of thought,' but when the warring Straumli realm use an ancient Transcendent artifact as a weapon, they unwittingly unleash an awesome power that destroys thousands of worlds and enslaves all natural and artificial intelligence. 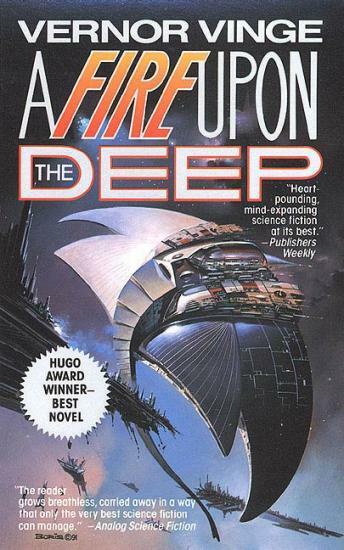 A Fire Upon The Deep, which began the Zones of Thought series, is the winner of the 1993 Hugo Award for Best Novel. This was an excellent book. For me, it was a required read for a college Sci Fi class; having the option of an audio book was most beneficial in forming the story in my head.